The ukulele clearly hasn't been physically growing in size, it is as small as ever. The popularity of this tiny instrument has risen dramatically over the past few years. In 2007, the ukulele began to find its way into primary schools as a worthy replacement for those squealing recorders we were all forced to play at some point during our youth. It has also been adopted by commercial bands such as Beirut and Noah and the Whale as an alter-native or accompaniment to the acoustic guitar. George Harrison had been a notable endorsee of the ukulele for years (as has Joe Brown - see his Ukulele tutorial in the forthcoming GT176, April 2010), and the emergence of the Ukulele Orchestra of Great Britain has only strengthened the renaissance of the small stringed instrument. 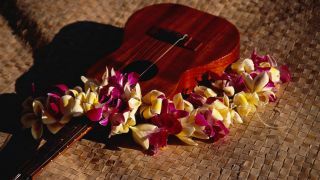 The ukulele originated in Hawaii during the 19th century. It is classified as a picked lute, as it typically has four nylon strings. It also comes in four registers; soprano, concert, tenor, and baritone. Martin began to manufacture their own line of ukuleles in the early 1920s along with other American instrument manufacturers Regal and Harmony. The instrument was a success through the pre-war era as an icon of the Jazz Age. Popular because of the small size and relative price of the instrument; inexpensive compared to other tuned in-struments of the day. The ukulele was mass produced between 1940 and 1960 by an American plastics manufacturer, which degraded the instruments build quality as nine million inexpensive ukuleles were turned out. From here the ukulele gradually lost popularity, joining the likes of the ka-zoo as a cheap novelty instrument in music shops around the world. A major influence in Hawaiian music, the late Iz's 1993 medley of Somewhere Over the Rainbow and What a Wonderful World has been featured in several films, TV programs, and adverts. An American band whose sound is heavily dependent on the ukulele, along with a selection of other bespoke instruments including the accordion, mandolin, and a range of brass. The band's sound is a crossover somewhere between Eastern European folk and Western pop. This clip shows excellent use of the ukulele as a solo instrument. If this interests you, check out the Ukulele Orchestra of Great Britain as they have a slightly comic approach to the ukulele. Build Your Own Electric Uke! Finally, a YouTube clip that shows a man building his own electric ukulele from scratch. That's right, the ukulele is also available in electric; perfect for those who can't be without distortion in their lives. Now where did I leave my sanding block!